Move over, low-fat diets! There’s a fatty superfood on the block and it can actually help you lose weight. Say hello to nuts and seeds, the snack that curbs hunger and improves your body’s ability to burn calories. Nuts and seeds are packed with proteins and essential vitamins and minerals, making them a true health hero among foods. But they’re also high in fat and calories, which has given them a bit of a bad rap. A lot of people shun nuts because they worry that eating them will lead to weight gain. Fortunately, eating fat doesn’t necessarily make you fat, and the benefits of the low-fat diets pushed by dieticians and government guidelines in the past have been debunked (partly because processed low-fat food products tend to be higher in sugar, which can contribute to weight gain). On the contrary, adding healthy fats from nuts to your diet can help you maintain or even lose weight. Several large studies have showed that people who eat nuts more often have a lower body weight than those who don’t. Sure, some of that could be due to the fact that people who eat nuts have a healthier lifestyle overall. But other studies have confirmed that nuts don’t make it harder to lose weight and may actually help. 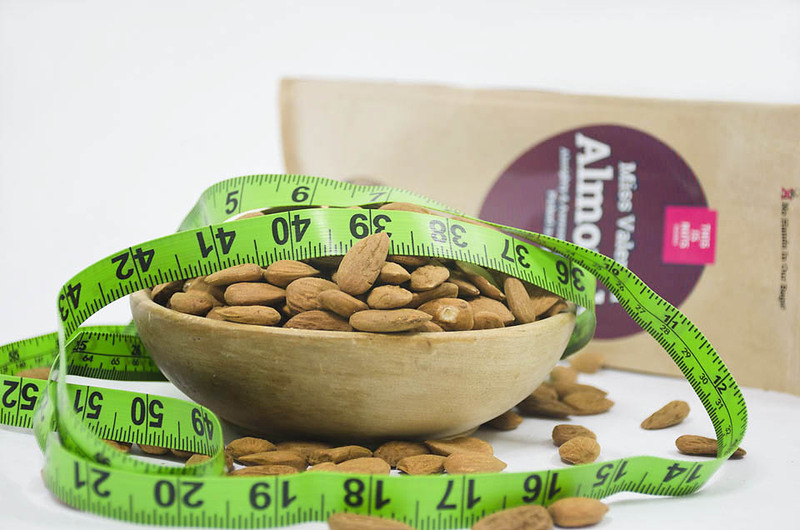 In one of them, a group of overweight individuals who supplemented their diets with a handful of almonds every day lost 62 percent more weight and 56 percent more fat mass than the individuals in the control group, who ate the same amount of calories but no nuts. So how exactly do nuts help you maintain a healthy weight? Nuts can help your body burn calories. As strange as it may sound, this is likely due to the high levels of monounsaturated and polyunsaturated fats in nuts. One study showed that people who ate a diet high in these healthy fats increased their resting energy expenditure (i.e. the number of calories you spend each day regardless of how much you exercise) by 4 percent compared with people who ate a diet high in saturated fats. Nuts make you feel full longer. Even though nuts are high in calories, they can help you eat fewer calories overall because they reduce hunger and make you feel full longer. Researchers believe this is due to the nuts causing an increased production of certain hormones that suppress hunger. The effect is especially powerful when eating nuts as a snack. Not all the fat in the nuts is absorbed by your body. Nuts are packed with fiber, which means some of the nutrients pass through the bowels without getting digested. For example, one study found that nearly 18 percent of the fat in peanuts is excreted. To get the most bang for your weight loss buck, choose whole, unprocessed nuts, since they have the best effect. Naturally, portion control is key if you’re trying to lose weight. A handful of nuts per day is sufficient to tame your appetite and enjoy a slew of other health benefits in the process, including improved cholesterol and a reduced risk of heart disease. Now, that should be reason enough to ditch that low-fat diet forever.